Learn about the history of the Lars Restoration Project on this page. The timeline will help you understand the trials and tribulations we encountered in turning this foolish, idealistic crusade into a veritable tour the force of Star Wars fandom. It was clear from the outset that fans love Star Wars in general, but also the Lars Homestead in particular. 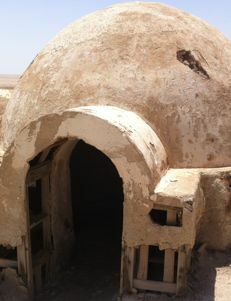 Mark Dermul, the Project Lead, had been to Tunisia many times, guiding over 50 fans to the filming locations of the desert planet Tatooine in the Star Wars Saga. During his latest trip, in 2010, the fans were flabbergasted with the poor state one particular and very iconic location was in. The Lars Homestead was almost destroyed by the climate of the Tunisian desert. Afterwards, while drinking a few Boga (Tunisian lemonade) in a local Cantina, some of them started joking about one day returning to restore the Lars Homestead to its full movie look-alike glory. What started as an off-the-cuff remark soon turned into a solid idea. Some of the Pioneers - affectionate name Mark came up with for his Tatooine travelers - mentioned the idea on Facebook and were overwhelmed with the positive reactions they received. Soon, they turned to their faithful tour guide to see if this folly of an idea could be turned into a reality. A website was opened to explain the restoration project and fans could donate as little as $2 and as much as they saw fit. In less than 10 months (!) we raised the required $10,000. Needless to say, we got very excited and worked out plans to get this project off the ground. Mark travels to Tunisia to scout for the filming locations for the very first time. His online report soon catapults him into an impromptu role of Tour Guide. Plans to return - with fans this time - form in the next months. The Trip to Tatooine is born. Mark takes 12 fans from all over the world (Belgium, UK, Holland, Ireland, Australia and USA) to Tunisia to tour the southern part of the country to visit the filming sites. Mark, believing this to be his Final Trip, returns to Tunisia with no less than 18 Pioneers (Belgium, Holland, Germany, UK, Ireland and USA). It was a trip that will be long remembered, since we left one week after the worldwide premiere of Star Wars, Episode III: 'Revenge of the Sith'. Mark publishes his first travel guide, aptly titled Trip to Tatooine, providing all the information future Pioneers will need to undertake their own expedition to the Jundland Wastes. He should have known better than to think 2005 would be the last time he would travel to Tunisia. Five years after his misnomed Final Trip, Mark organises a Tatooine Reunion. Again no less than 18 Pioneers visit all the filming locations. The fans are astounded with the poor state of the iconic movie location 'Lars Homestead Exterior' in the Chott el Jerid, southwest of Nefta. After visiting the Lars Homestead on this faithful day, the first idea to restore this iconic movie location take shape. Mark puts to paper his adventures with the latest group, including locations from Indiana Jones as well, in his new travel guide Tatooine Reunion. The plan for the project is launched on Facebook and gets an immediate and overwhelmingly positive response. Steve Sansweet, then Head of Fan Relations at Lucasfilm, gives us the thumbs up as well as permission to use an image from the original Star Wars movie on our promotional cards. Good news! With the help of the people at the Tunisian Tourism Office in Tozeur, Mark starts the negotiations with the governor to get permits to restore the Lars Homestead. After all, the location is the property of the Tunisian government. Donations are coming in, thanks to word of mouth, interviews on several podcasts (including the famous ForceCast), magazines (including Star Wars Insider) and the social media. In Tunisia, the civil revolution erupts. Our negotiations with the Tunisian government - to obtain the authorization and required permits - grinds to an immediate halt. We are, truth be told, pretty worried that this may be a serious setback for the Project. We are contacted by Legendary Times, a US-based company that has plans to produce the Tatooine Timepieces, high quality watches containing actual sand from the Tunisian filming locations. We happily agree and provide them with the required sand from our 2010 Trip. The commission we receive from Thomas, the owner, pays for the plaque we want to erect at the site. In less than 10 months, thanks to your generous donations, the project if fully funded. Over 425 donations were received. Amazing! We are in full go-mode and start preparing the trip in earnest. On October 23rd, a new government is elected in Tunisia. After months of holding our breath - and of course mindful of the tribulations the Tunisian people have been going through - we resume our negotiations for the project. Auhorized! On December 5th, as if it was an early Christmas present, we receive authorization from the Tunisian government to proceed with our plans. We still have a lot of planning to take care of, but the biggest hurdle has now been taken. Legendary Times starts shipping the highly anticipated Tatooine Timepieces and receives praise on social media for a wonderful collectible. A special edition is produced exclusively for the infamous 501st Legion. Legendary Times donates a huge part of the proceeds, boosting the budget up to $11,700. Travel arrangements are made: flights are booked, the car is rented, hotel reservations are made. We are getting very close to fulfilling our destiny to Save the Lars Homestead. Mark Dermul, Mark Cox, Terry Cooper, Robert Cunningham, Imanuel Dijk and Michel Verpoorten board the plane and head out to Tunisia on the 26th of May 2012 to Save the Lars Homestead. Read all about their adventures in the diary pages! Find out who who donated to make this restoration possible and meet the crew who traveled out to Tunisia to make it happen. We are currently hard at work creating a wonderful coffee table book, with loads of never before seen images. Stay tuned!